This installment of the Player Paraphernalia-series clocks in at 7 pages, 1 page front cover, 1 page SRD, 1 page advertisement, leaving us with 4 pages of content, so let’s take a look, shall we? The Imperial Druid’s angle, concept-wise, would be the inherent natural order of things within the animal kingdom, providing control over this concept by graces of the celestial Court. Imperial Druids thus need to be neutral good and may utilize metal weapons and monk weapons, gaining their proficiencies…but at the cost of all armor and shield proficiencies. The imperial druid also receives an imperial bond – either a domain chosen from air, earth, fire, good, celestial court, nobility and water or an animal companion with the Minor Foo Creature template at 1st level, the full foo creature template at 8th level and the imperial foo creature template at 18th level, but the companion neither receives evasion, nor improved evasion. Problem here: As written, the ability is obviously intended to modify animal companion, but does not explicitly state this, rendering it RAW an addition. While the intent is claer, RAW, this is still a nasty little oversight. All right, you’ll now note something – firs of all, yes, the Celestial Court domain is provided herein. The domain allows for 1/day communion with spirits, which acts as commune with nature, with the caveat that it also works in dungeons, cities, etc. The ability has an improper type: It should be SP, not SU, being a text-book modified SP. Additionally, it lacks a CL, which is problematic. The second ability falls prey to a similar issue: At 8th level, you can, as a standard action that does not provoke an AoO, call forth a celestial templated summon nature’s ally with a minimum Intelligence of 10, which remains for 1 round per level, with the summon nature’s ally spell-level being equal to 1/2 your class level (9th level version at 18th level) – while the wording is slightly wonky here, this still is okay. The template progression of the foo-templates encounters an issue: The application of the minor foo creature template is pretty straight-forward; so is the imperial foo creature template, which modifies the regular foo creature template. However, I am not sure whether the regular foo creature template replaces the minor foo creature template or replaces it. Oh, and gaining paired protection and stone defense at level 1 is BRUTAL and makes the companion even more OP than level 1 companions already are. Instead of nature sense and wild empathy, imperial druids may intimidate evil fey and evil outsiders, gaining +class level to the check. While the wording here is wonky, the ability works – though it is a boit odd in its presentation, implying that other characters can’t intimidate evil fey and outsiders…which is frankly, not true. The ability also nets Knowledge (nobility) as a class skill (which should be noted in the skill-section) and grants ” a +2 bonus to any skill-checks involving this skill”…so…to all Knowledge (Nobility)-checks? Is it me or is that redundant? The imperial druid may also spontaneously convert non-domain spells (if applicable) to summon nature’s ally-spells of the same level, adding kami to the list of creatures that can be called. Instead of woodland stride, trackless step and thousand faces, the imperial druid receives a scaling natural armor bonus and, at 10th level, hardness 4 (which scales up to 8), though this costs 5 feet of movement in three steps, reducing movement down to up to 10 feet. Hardness 4, bought with what can be countered by a level 1 spell. Hardness is better than DR; notably energy and ranged attacks halve their damage before applying hardness. This is INSANE, even with the caveat of not working in wild shape and being able to negate it via stone to flesh. The Wild shape (gained at 4th level, with a delay) similarly allows for the addition of the lesser foo creature template, with sizes of the animal form chosen and class levels determining the foo-creature template that is gained, though the ability erroneously calls the first template gained “lesser” instead of “minor”, botching pretty nastily in the progression of the templates. Conversely, higher levels allow for the assumption of draconic forms, with foo templates added, though at least the breath weapons thus gained adhere to a daily limit. Editing and formatting are rather good on a formal level – there are no obvious typos and the like herein. Ona rules-language level, there are quite a few non-standard wordings, slightly unpleasant hiccups and the like, which partially render abilities more opaque then they should be. Layout adheres to an easy to read full-color two-column standard and the pdf comes fully bookmarked and with the good type of hand-crafted, actually helpful hyperlinks – kudos for those! John Buckley has crafted a thematically cool archetype herein – the idea of a quasi-eastern druid with fitting servants, in service of the celestial bureaucracy is something I really enjoy in theme. Alas, beyond some unnecessary hiccups in the finer aspects of rules-language, this archetype is pretty much text-book power-creep. As presented, the imperial druid pretty much mops the floor with the regular druid, gaining superior summons, superior companions, superior bonds…and losing basically the fluff/utility tricks. The decreasing movement can be offset exceedingly easy and will never become an issue, so that also is pretty problematic. This pdf pretty much gets its components, on a formal level, almost right, so every GM can make this properly work with a minimum of work – that’s a big plus. At the same time, the archetype needs a revision regarding its power creep for arguably already one of the most powerful core classes – the delayed wild-shape progression (which still happens stronger and at full level) certainly does not justify the significant power-gain this one receives. The balance-concerns alongside with the formal glitches, alas, make it impossible for me to round up from my final verdict, in spite of the low price point. My final rating will clock in at 2.5 stars, rounded down to 2 for the purpose of this platform. 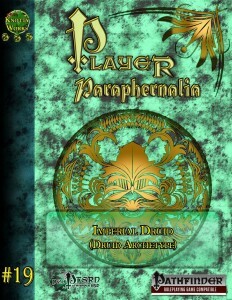 You can get this inexpensive, if somewhat flawed archetype here on OBS and here on d20pfsrd.com’s shop.